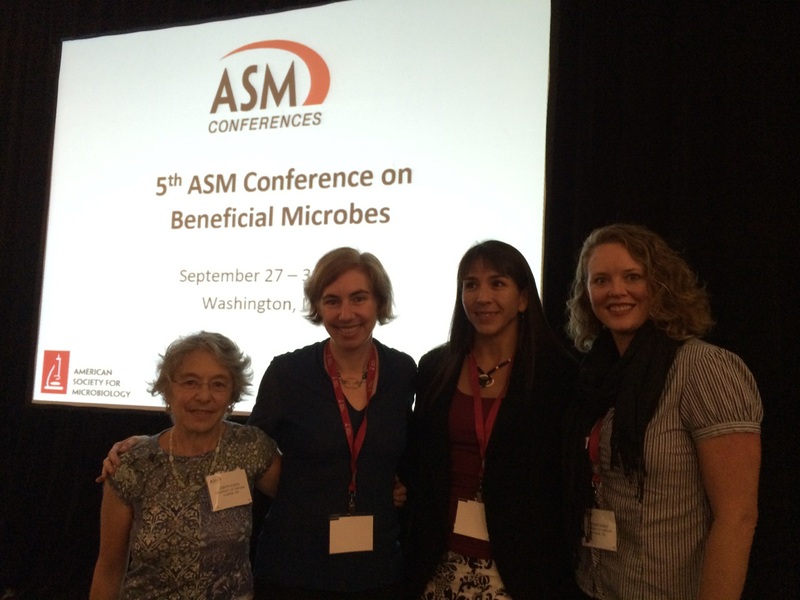 META Center PIs Karen Guillemin and Judith Eisen and postdoctoral fellows Tiffani Jones and Kat Milligan-Myhre attended the ASM Conference of Beneficial Microbes in Washington D.C. September 27-30. Jones presented a talk on her work on microbiota in transgenic Drosophila and Milligan-Myhre presented a poster on her gnotobiotic stickleback research. Both fellows were awarded travel grants to attend the meeting. The gathering demonstrated the dynamic and exciting state of the field of host-microbe research, with new insights being generated by a diversity of systems from mycorrhizal fungi to deer ticks to allogeneic hematopoietic stem cell transplant patients. It is clear that the field is moving from descriptive studies of host-associated microbial communities to mechanistic analyses of their function, with researchers harnessing the power of many disciplines to tackle these studies. The energy of the participants during talks, poster sessions, and on the dance floor, was infectious.